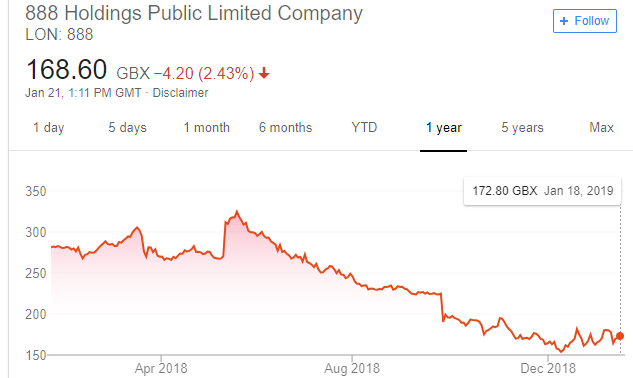 If you have been keeping an eye on the stock market, you know that the values of iGaming company stocks have been tanking overall, together, over the past year. Well, maybe not tanking, but the market has definitely been more than bearish on some of the largest iGaming company stocks over the past year. The reasons are more than apparent: parts of EU that have been grey in terms of regulation for online gaming platforms have recently introduced more regulation. This has caused a significant number of shareholders to lose their confidence in the shares of the companies and the value of the stocks has been on a steady decline for a year now. Though I am here to tell you, with more confidence than ever, that this is the best time to start buying their shares. While you might believe this to be a gamble, I believe there is a serious reason for this. So let us look a little closer at the share value of some of the largest iGaming companies and figure out what is next for them. 888 has had a hard year, especially after the meteoric rise in stock value sometime in June. But what goes up, will come down, especially meteors. The result is that the stock has recently recovered from the lowest it has been. With the recent great performance of the Wink Bingo and the US ruling that gambling across state borders was illegal, the stock slid down recently. Yet, the company is now introducing some new live games to its platform, and recent reports indicate that iGaming had the largest revenue share of the entire gaming industry in the US. This is driving a new investment wave into the large iGaming company and has already caused a cautious increase in the stock value. Combine that with the company working towards acquiring a license to work in different states, and you will get a stock with a whole lot of potential in 2019. LeoVegas has been the least volatile in its stock value, in terms of it being a steady decline over the year. Despite this, it has had its own peaks and valleys over the year, with some of them bringing fortune to those who knew to sell and those who knew when to buy. Though it seems the value of the stock has hit a nice plateau, with a potential upward trend appearing to be coming. But where is it coming from? Well, the company has recently added some new payment systems to its gambling platforms, the recent influx of players as a result of a jackpot incentive and the “Who wants to be a millionaire” sponsorship they are providing are all bound to help the stock rise. Definitely worth keeping an eye on. 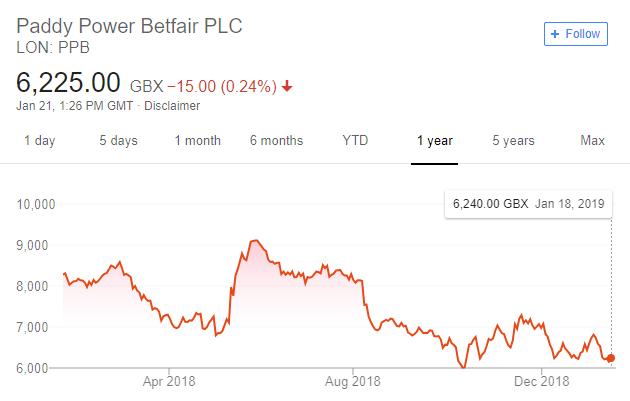 Paddy Power has been the company to see the most volatility this year, jumping the incredible highs and falling to scary lows at different points throughout the year, always following the changes in the regulations and the market with the rest of the companies. Now the stock value lies close to its lowest of the year. 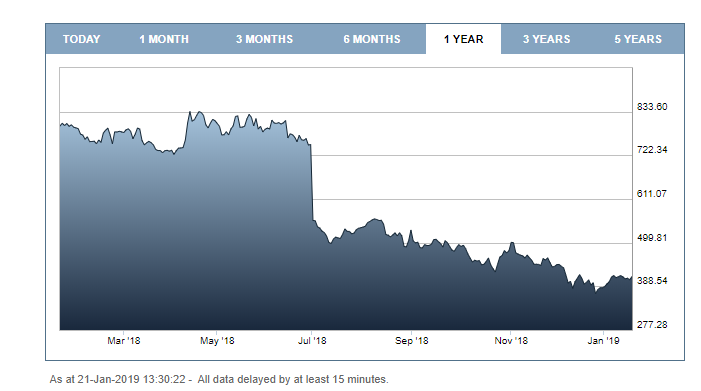 The Paddy Power stock, to be honest, is the one we are most pessimistic about, what with the recent news about paying off customers to be quiet about privacy agreement violations. Though we still believe there might be a light at the end of the tunnel. The value might fall further when it will be optimal to buy it, and start recovering with Paddy Power introducing some new jackpot games. The company was thought to be the safest to keep your investment in, up until the beginning of June, when the stock value fell abruptly. Since then the stock has been on a seemingly unstoppable downward trend, with a steadily bearish market doing its best to ignore it. Though, since the beginning of January, the stock has increased in value. The news about the company’s release of a new data aggregation technology, as well as the fact that the platform was launched in Sweden after the introduction of regulation, we have a recipe for positive change in the market value of the Playtech stock. So what that the downward trend for a whole lot of iGaming companies has lasted a year? This only gives potential shareholders a chance to make a nice profit off of the current lows for the share values of these companies. The coming increase in their values is undeniable, and so is the fact that now is the time when you should be making the gamble of investing in these companies.